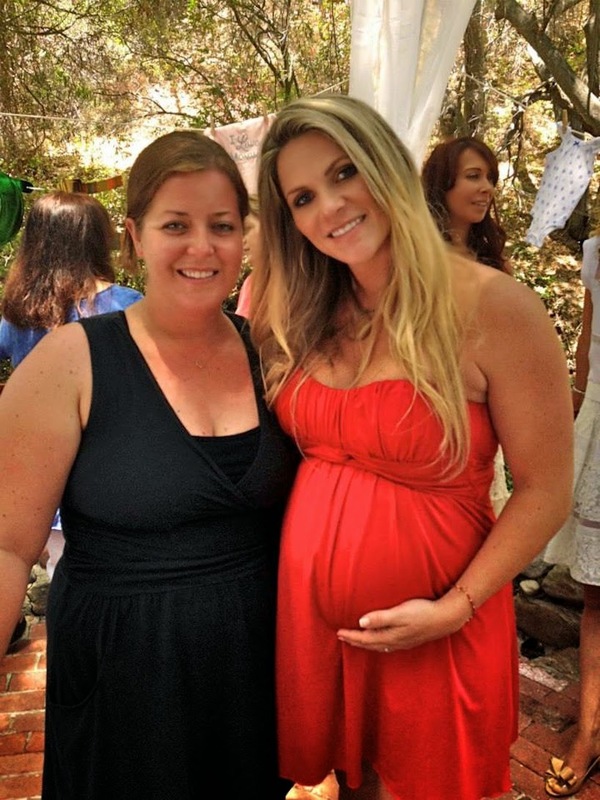 Paul and I darted out of town this weekend to L.A. to attend my sister-in-law's baby shower! On the way we stopped at Sequoia and Kings Canyon National Parks where we visited the giant Sequoias. The baby shower was lovely and it was so nice to catch up with this pretty one! 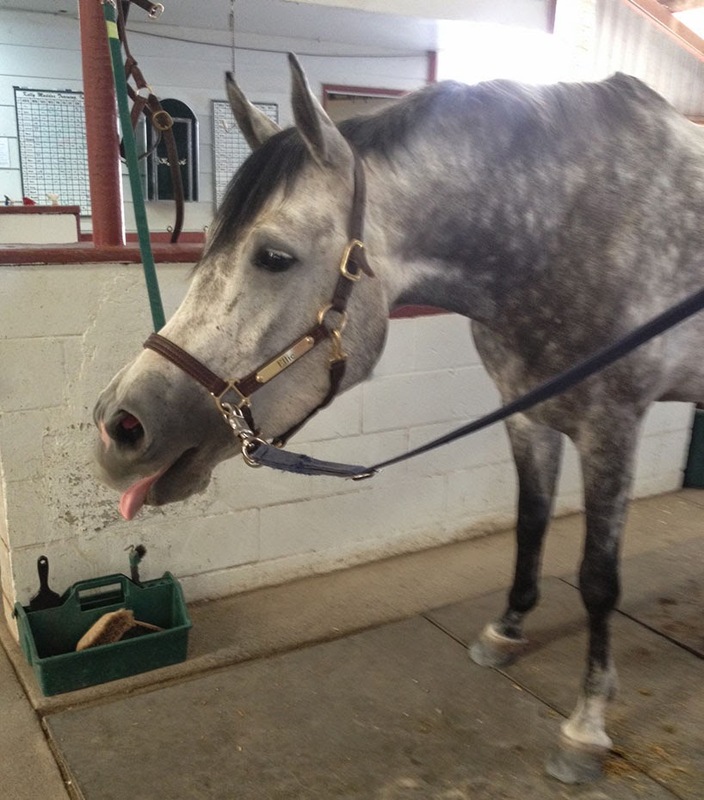 Back at home I had enlisted my barn friend, Chris, to give Ellie a ride on Saturday and I got the report that she was a delight... along with this pic! Two pretty ladies! 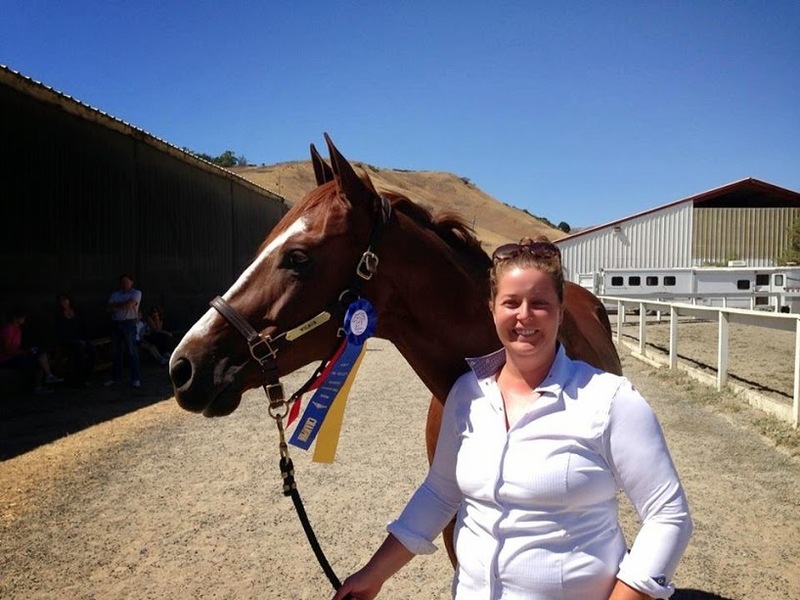 Finally- a wonderful Monday for my friend Jen, whose mare has been up at UC Davis for the past 7 weeks fighting a bacterial infection in her eye! Finally home today! Welcome home sweet Pie! 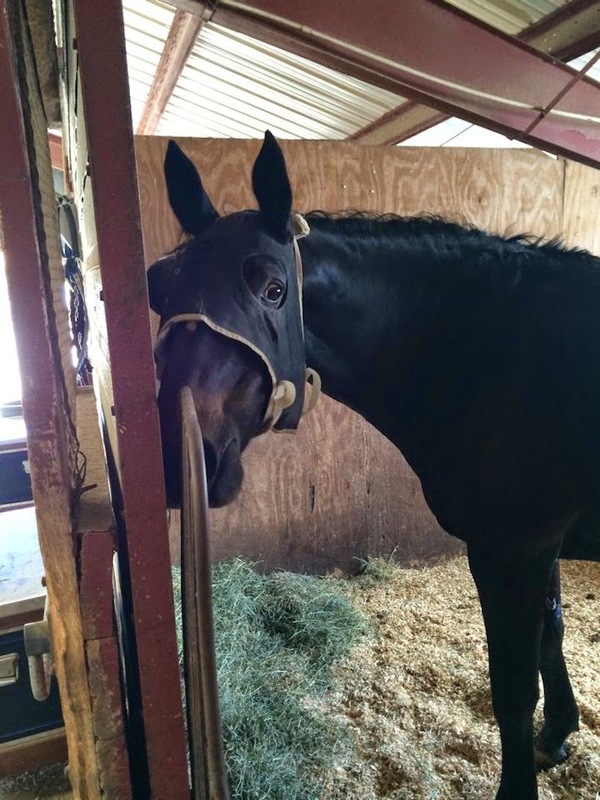 I just had to share a post from She Moved to Texas about how much her "free" horse is costing her. Clever, witty, and well written. Read it. Because it's the truth! Who cares how much the horse cost? The real expense is in the day to day. Now I'm not going to pretend that Paul and I don't live a comfortable life. But when Lauren notes that the annual vet care of a horse is equivalent to 40 mani/pedis at a nail salon or that lessons cost out to be 30 pairs of Rainbow Sandals (best sandals EVER) she is not kidding. My last pedi was treat from Paul, my hair color is au natural, and my socks have holes in them but I am so glad that I scrimp each month and forgo the "finer things in life" to enjoy Ellie & Wilbur! At the end of the day I won't remember what color my nails were in June of 2013 but I will remember those great rides! I was in a tack store all day today and I didn't buy a thing! What is wrong with me? I was there for work. In my line of business I'm confronted daily with the challenges faced by brick & mortar business competing alongside the .com giants. 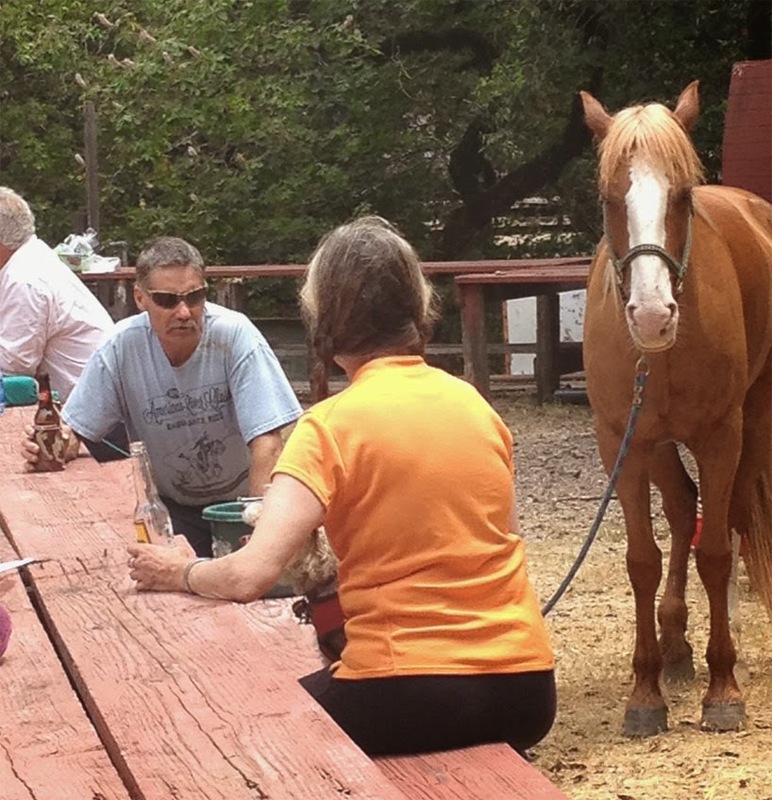 Valley Tack was my go to growing up- about a 45 minute drive from my house. I distinctly recall one trip where I had been instructed by my trainer to pick up a bit and some random tack for a horse I was half leasing. Of course I had no idea what size bit to purchase- nor exactly what type of Eggbutt to get- and ended up getting an incorrect bit all around. I bet my Mom LOVED that second trip out to VT. I never had much to buy but could spend forever pining over stock pins and Breyers. 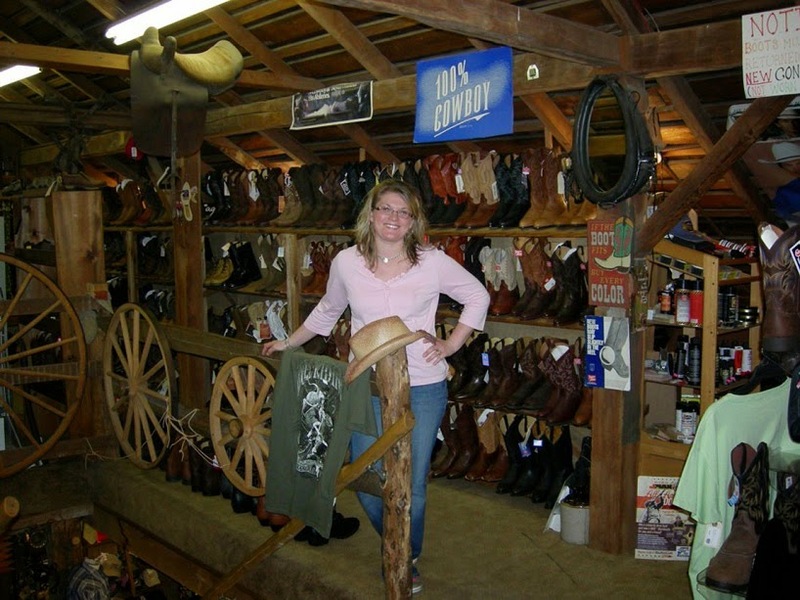 Tell me about your local tack store and why you love it! 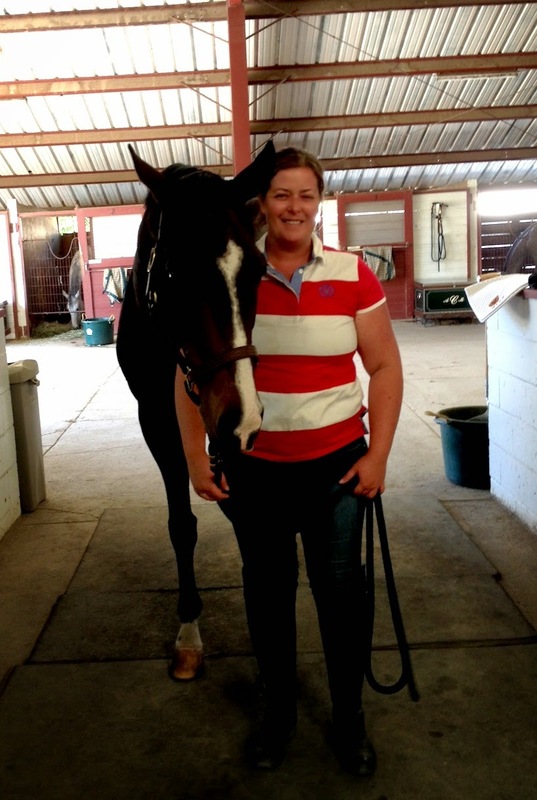 A random web photo of Valley Tack and (possibly) the owner. TWO LEVELS yo! There is nothing worse than getting home after a 12 hour day and realizing that I have blog-writers block! Last week Paul initiated "Fitness Month." He has been swimming for the past several years on a Masters team that practices from 7-8pm. They also practice at 5:30am. See where this is going? In case you don't, Paul and I are waking up at 5am every Mon-Thurs to embark on some type of physical activity. That's where the 12 hour day came from- I was out the door by 5:20 to head to a spin class- "go me (!!!!)" and also "gah!" As I was desperately trying to come up with some blog fodder by scrolling through old photos I ran across one of myself and Chance. Chance is the most handsome TB gelding owned by my friend Chris (who also made homemade cookies and left some in my trunk tonight). 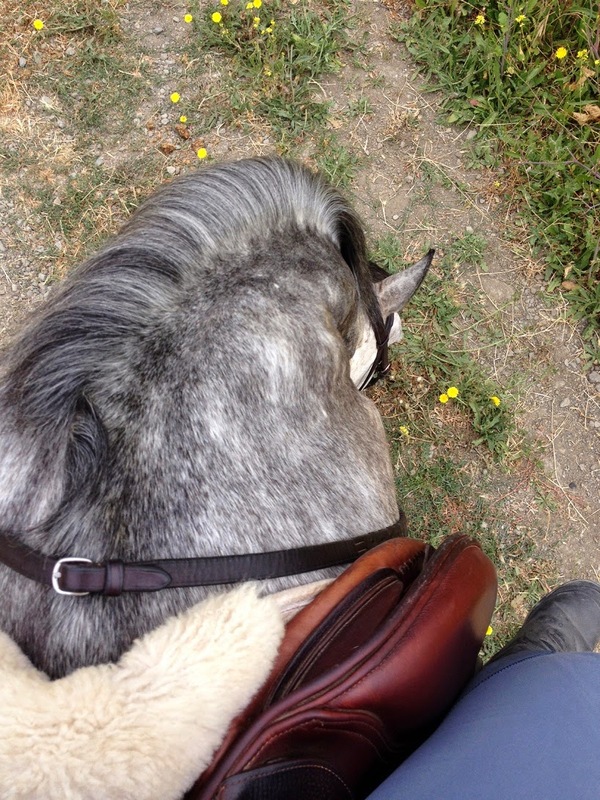 She was out of town a few weeks ago and asked if I could give him a hack- which I very much needed after the Friday I'd had a work! It was that perfect night- the weather was gorgeous and we were the only ones out there (except for other Emily who took this pic). He was super and easy. And you know when you're all by yourself, cantering around, and there's that little bit of glee- like I can't believe I get to do this? Perhaps it was a the super structured lessons I had when I was young....now when I find myself- by myself- hacking around I'm always a little tickled. I love that my fabulous barn friends have enough faith that I won't break their horses to let me fill in! 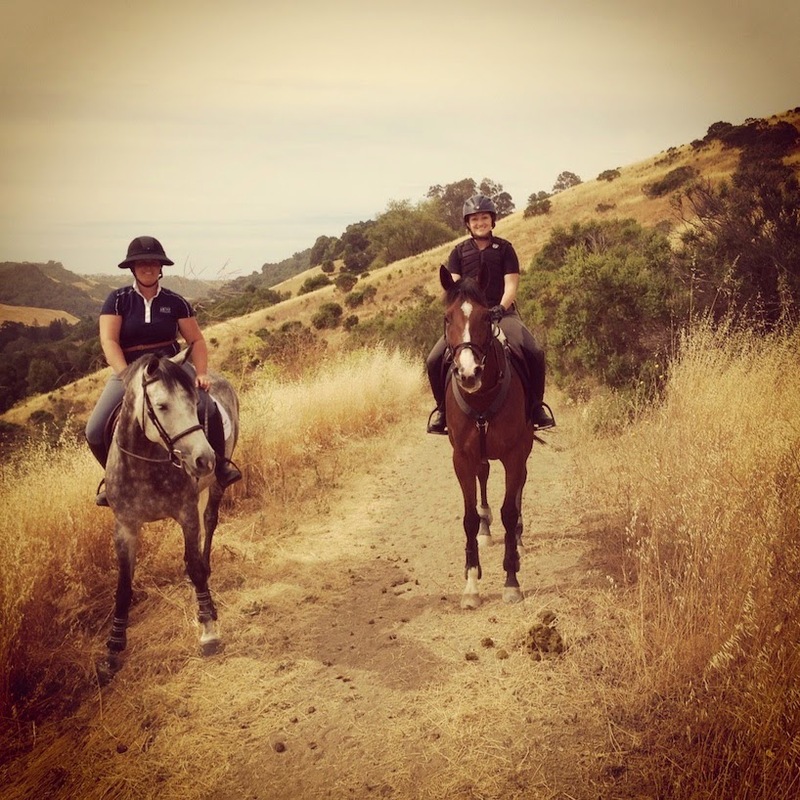 A lot of my fellow horse bloggers are owners- do you get that chance to hop on something different once in a while? Fast forwarding a bit because tonight I found a bright eyed, bushy tailed horse who was obviously feeling much, much better! 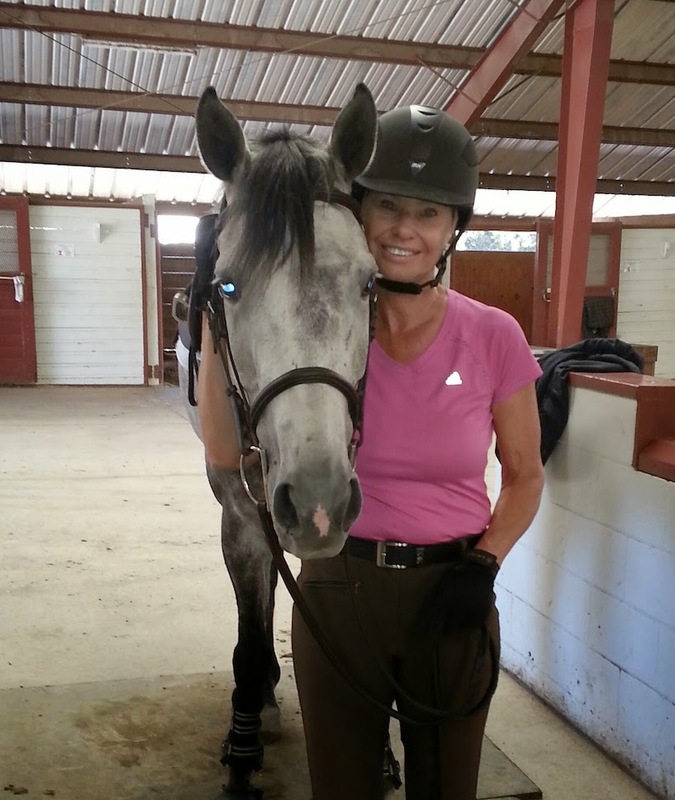 I had planned to hack on Saturday and meet my friend Claire for a trail ride at 10. Ellie's poo situation actually seemed to be getting worse (if that's possible) so my hack turned into a quiet walk to get the gut moving and a short loop with Claire on her baby TB, Louie. Ellie got her temperature taken and we made sure she was hydrated- all signs pointed towards normal. Minus the poop of course. Sunday I arrived to find loose stool, runs, and a ton of breakfast still left in Ellie's stall. 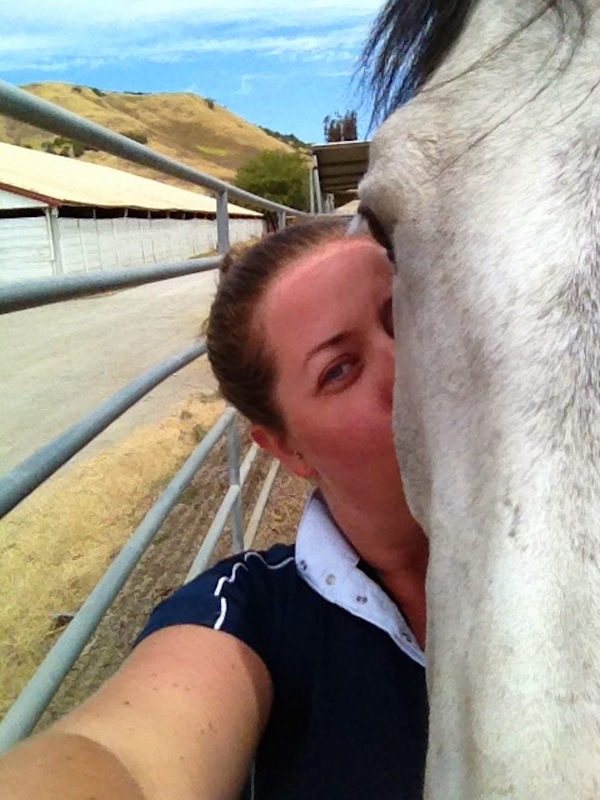 I cancelled my lesson, wandered down to Claire's barn to vent, then chatted with Emma about next steps. We gave her a flake of Alfalfa, which she wolfed down (I know- normally we would not switch out hay- but in this case I think it was for the best), and I hopped on Emma's baby TB mare, Sophia, for a hack. 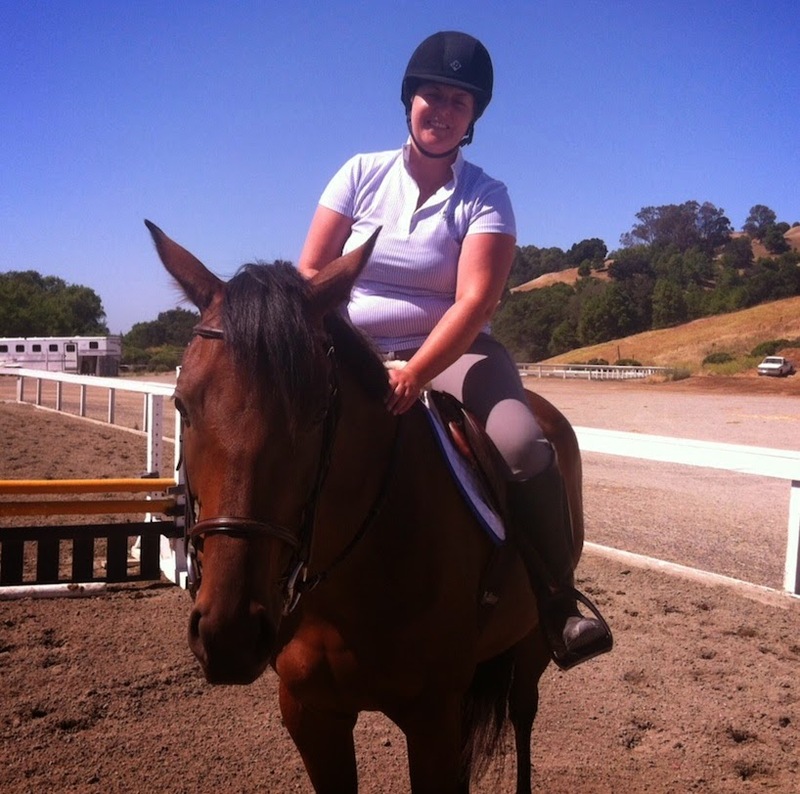 She's a lovely mare and I always enjoy riding something different! Emma was switching horses from the show at Woodside so was able to check on Ells into the evening and reported that she was eating dinner and pooping and that all looked well. Fingers crossed that the hay switch has finally settled and we can get back to work! Louie was being a little weirdo! Saturday cat nap for Polly! 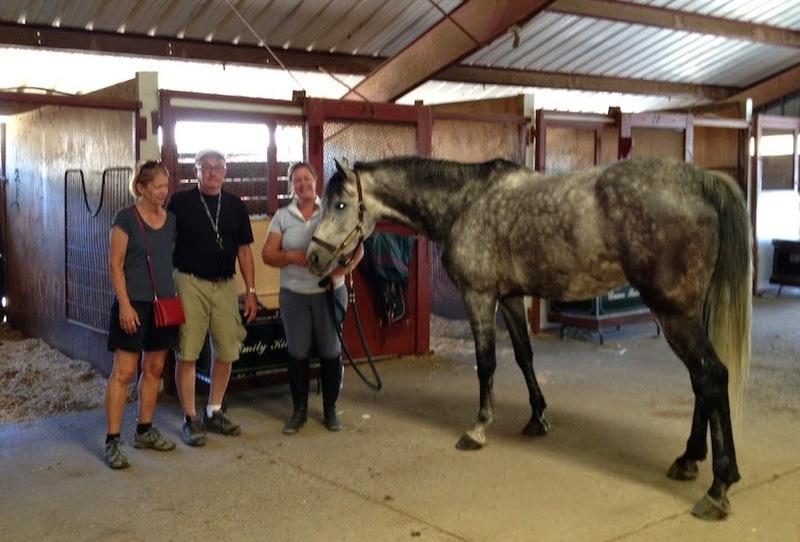 Yes- unfortunately this title will carry us through the weekend posts as most of my time at the barn was spent discussing, observing, and analyzing a lot of poo. But an optimistic start to the day! 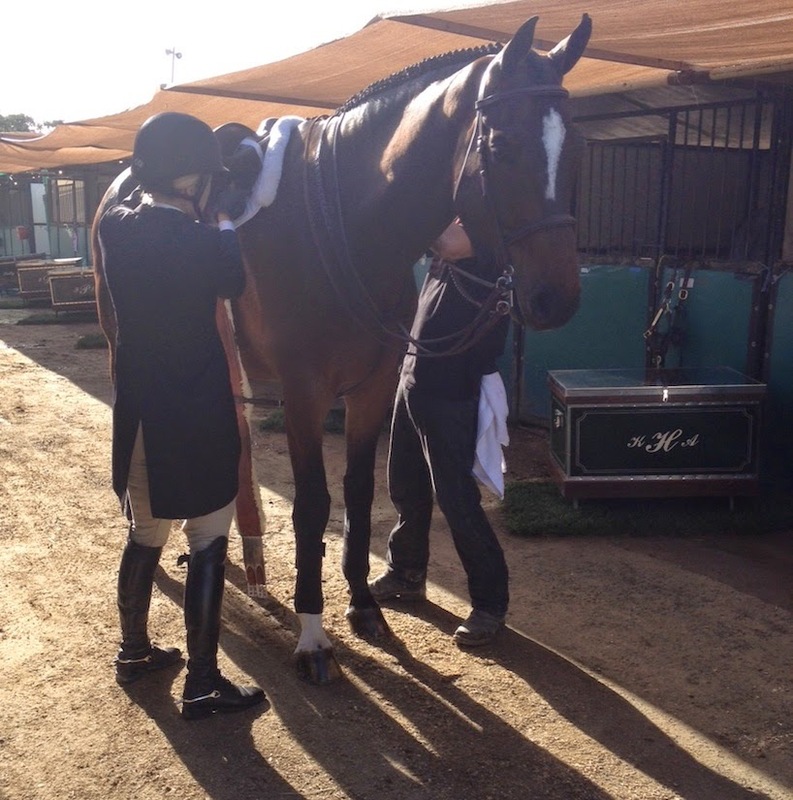 KMT is at Woodside and they were running the Hunter Derby at 8am Friday. I thought the early start was quite refreshing and swung by before work just in time to see Kelly and Denny ride to tenth place and Rouie win her 1.10 jumpers! I had planned to pick up new treats while I was there but after looking at the price tags and considering the budget (self imposed & rather ambiguous) I decided I would try my hand at making my own! I did stop by the barn to graze Ellie at the end of the day- we've still got a single patch of green grass right behind the wash racks- and made sure she was comfortable enough and hydrated. Then on to Farmer Joes to pick up the ingredients for my cookies! My coworker, Keir, is a fabulous vegan baker in SoCal so I borrowed her recipe and gave her a quick buzz so she could give this non-baker the 411. 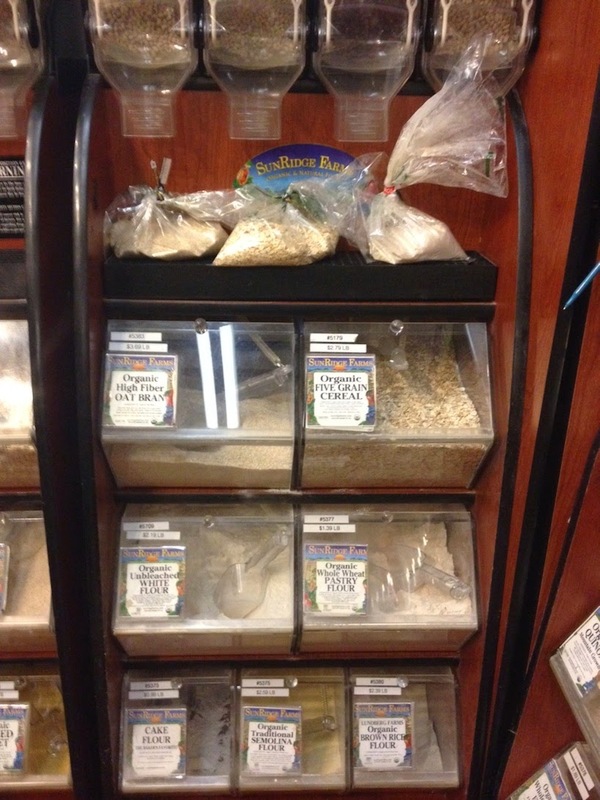 To my delight Farmer Joes had most of the dry goods in bulk bins so I wasn't buying 10lb bags of oats and flour! I found everything but the peppermint. 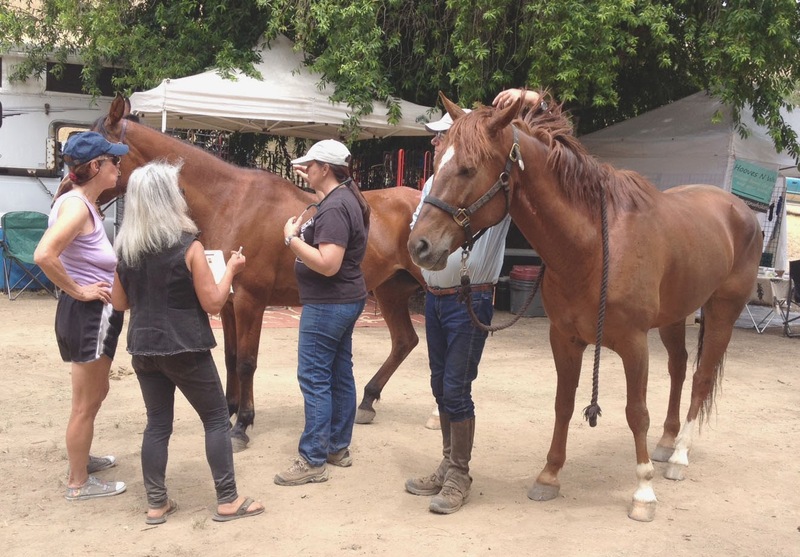 Despite some initial trepidation the cookies came out just fine (Paul and I taste tested) and were packed along with some Sugar Cubes and ready to head to the barn for Saturday! 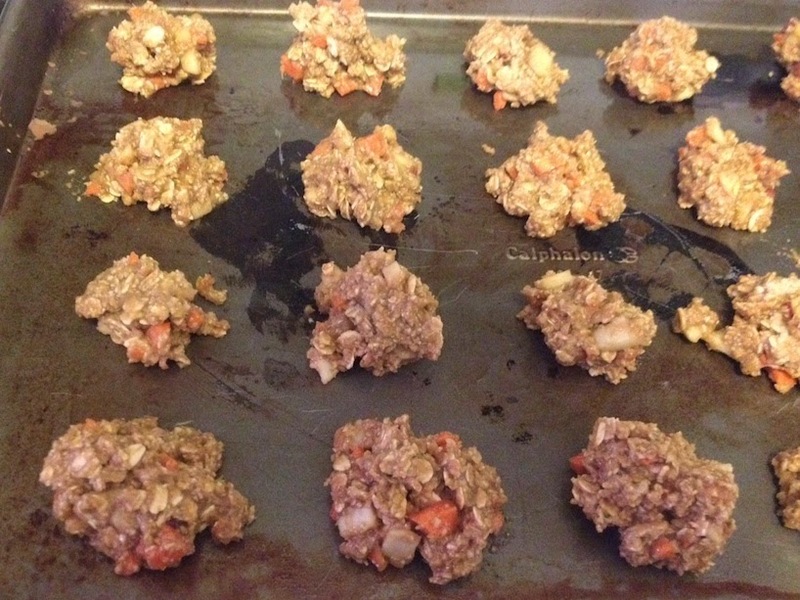 I chopped the carrots (no grater) and should have probably baked these for 5-10 more minutes to get a crunch. 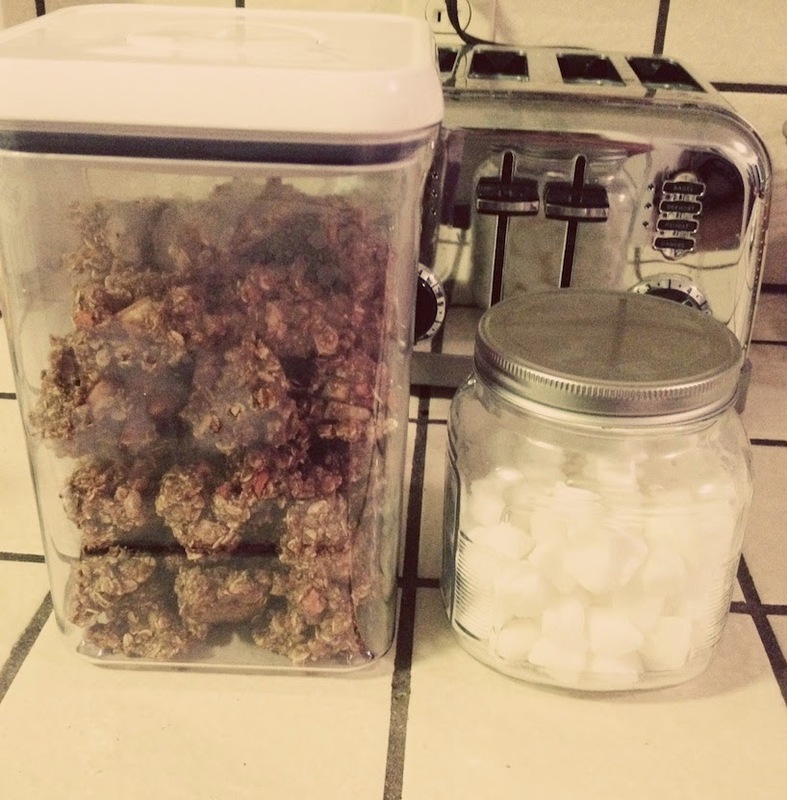 I am going to make them again for sure- a great alternative to store bought versions! 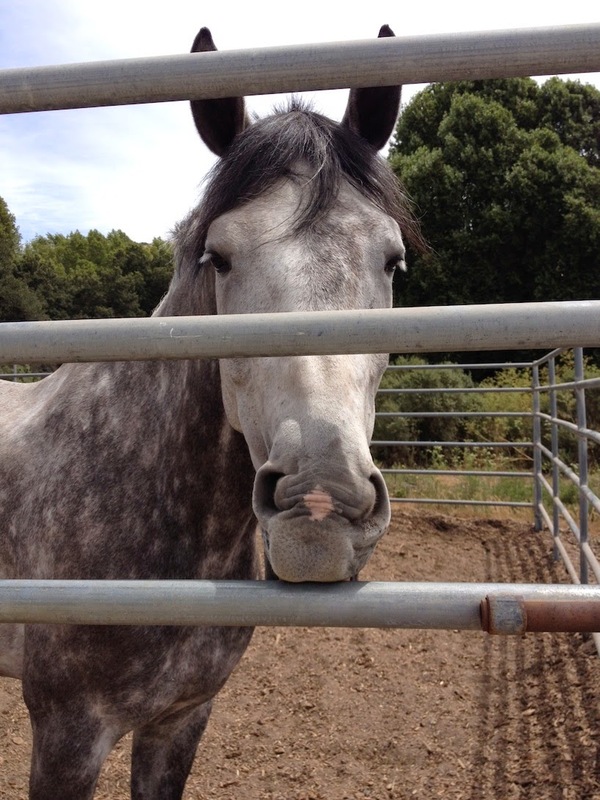 If your horse gets treats- what is their favorite? Little Elle has had diarrhea for the past week- poor girl. The trainers have been keeping an eye on her after we first noticed on Sunday. I haven't been out much this week but when I went to ride tonight there was a bit of an episode in the crossties. Minor but still concerning so we're going to give her three days of bio-sponge to see if that helps her tummy. 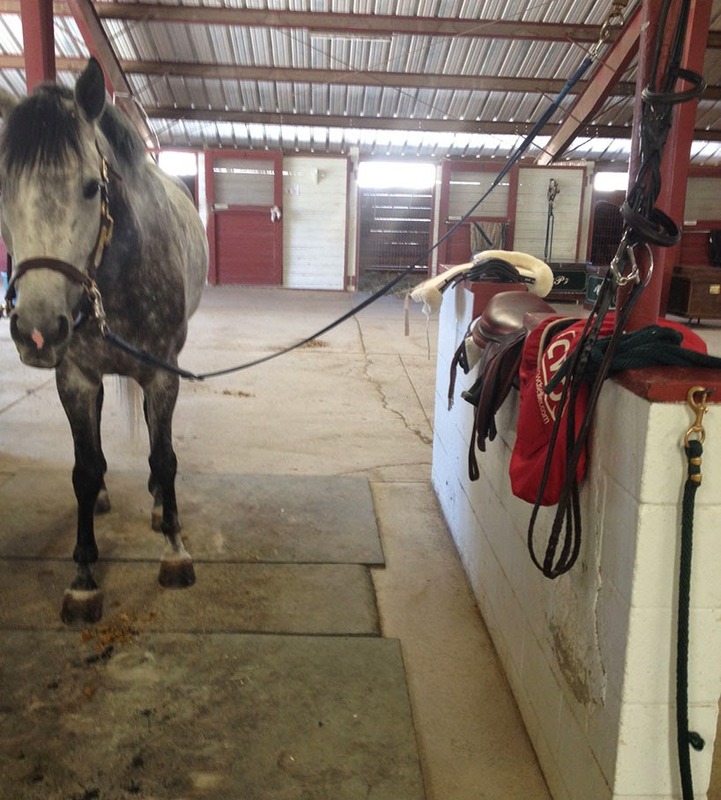 I'm going to vent for a quick second here- there are many types of training barn arrangements and in our case the barn is privately owned and trainers lease space- and hay is provided by the barn not by the training group so KMT is not sourcing hay. I've noticed the quality of the grass hay varies but this is by far the worst batch yet. I understand there has been an influx of horses on the facility and hay is moved through faster- but since we had a (relatively substantial) board increase in May I certainly don't feel as if quality should be sacrificed. Particularly when it puts my horse's sensitive digestive tract at risk!!!! We gave her a very light workout tonight just to get her moving and she was great. 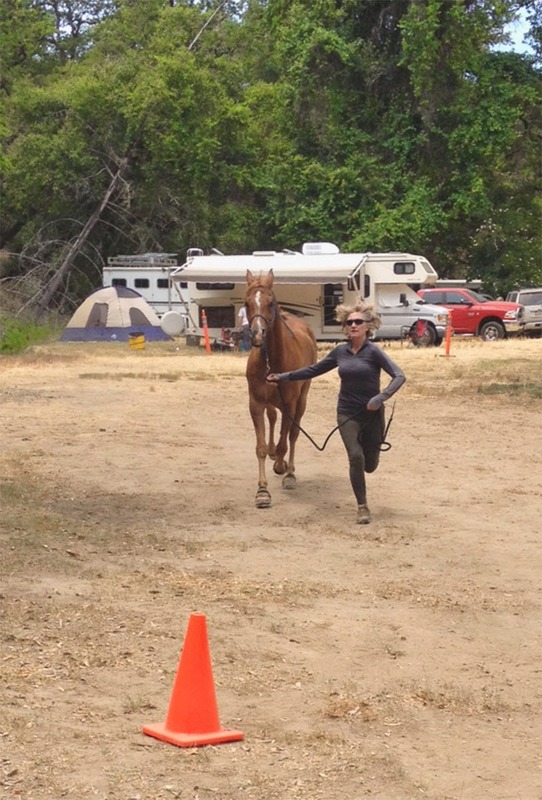 When I put her back in the crossties after the ride she seemed a little unresponsive but then started yawning like crazy which I chalked up to being exhausted after her very tough week. Geez- as if- that girl has the life. I'm just a worried Mum! Can't help but reminisce a bit as we count down to our next KMT schooling show in two weeks that it was around this time last year when Wilbur was Champion at his very first show (pile of pole division)! He was such a good boy and I was one proud momma! 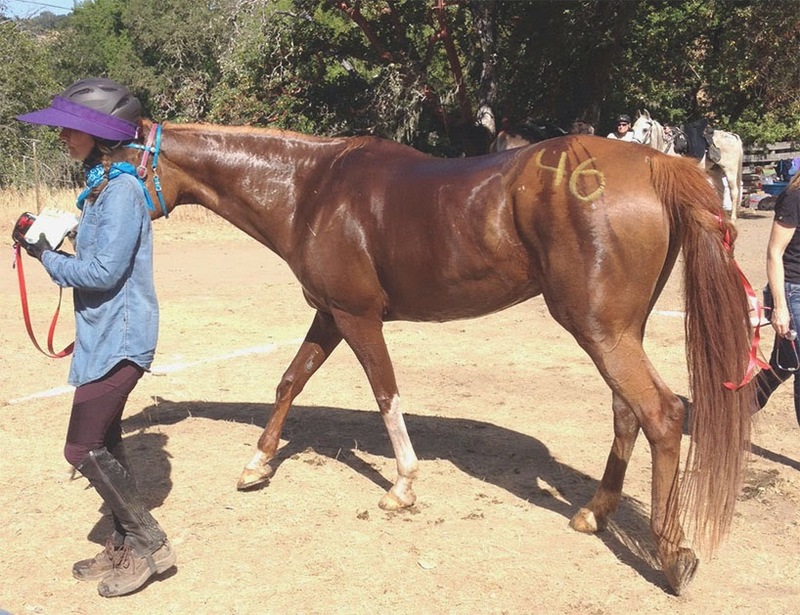 You may remember that Ellie came to me with an Endurance background, which I detailed in From Endurance Horse to Hunter, but what do Endurance riders actually look like? What do they do? 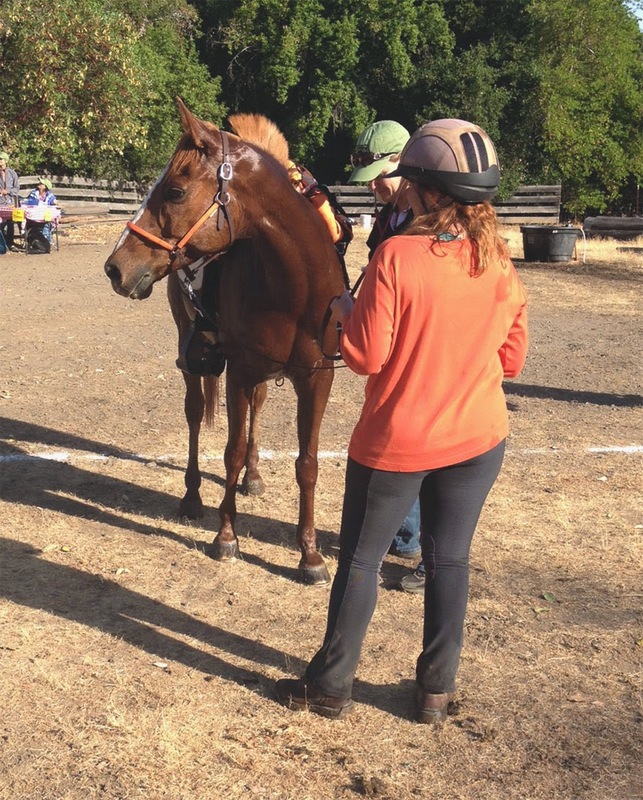 I found out on Saturday when I volunteered with a coworker to help at the Cooley Ranch Endurance Ride. Little J (as I so professionally call her at work) and I arrived at Lake Sonoma around 7:30am and were shuttled to the vet check a few miles from the base camp (which looked like an abandoned town with trailers and tents akimbo). By this time the 50 mile riders and the 25 mile riders (Limited Distance) had already left camp at 6am and 7am respectively. 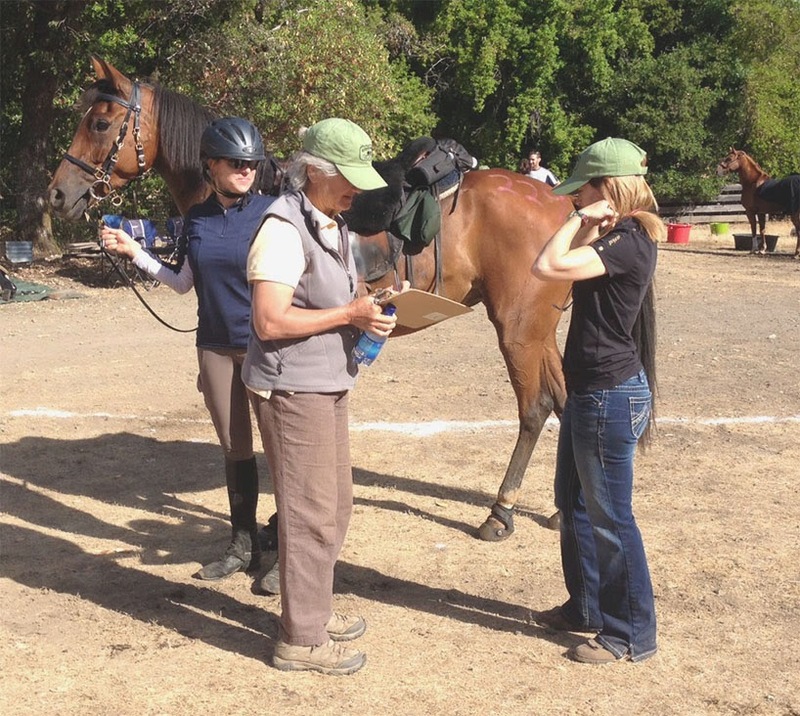 Riders are required to stop in at the vet check- once for the LD riders and twice for the 50 mile riders and they must remain at the vet checkpoint for a minimum of 1 hour. With 60 riders total the action was just getting started as the LD riders were coming in for their stop. 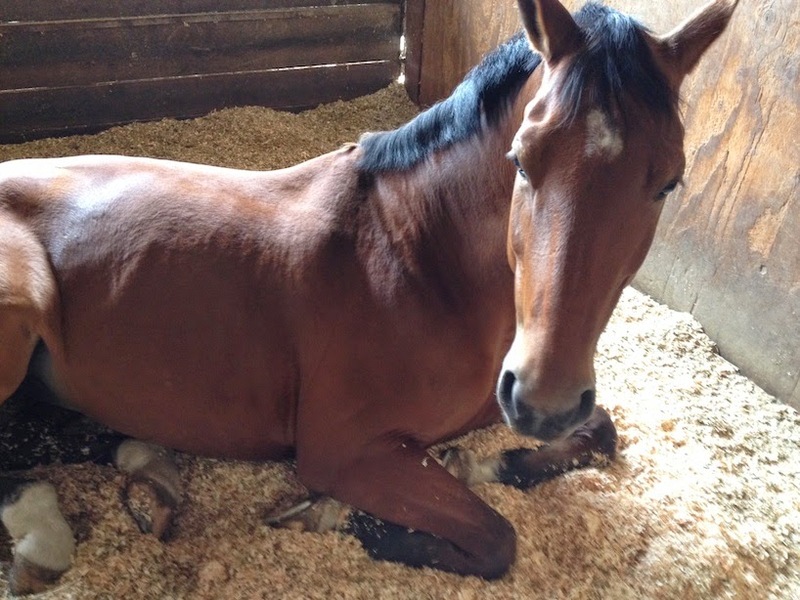 The entire goal of the vet check is rest and recovery for the horse. As the riders enter (often dismounted to help the heartbeat start to come down) they give their number to a volunteer who writes down their time on a card which is taken to P&R (Pulse and Recovery). 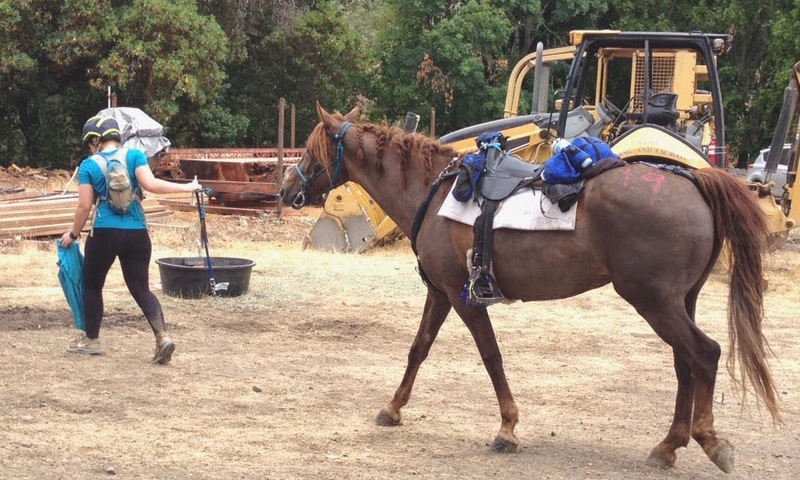 Horses have 30 minutes from entering the camp to resume a heartbeat of 60 or below. 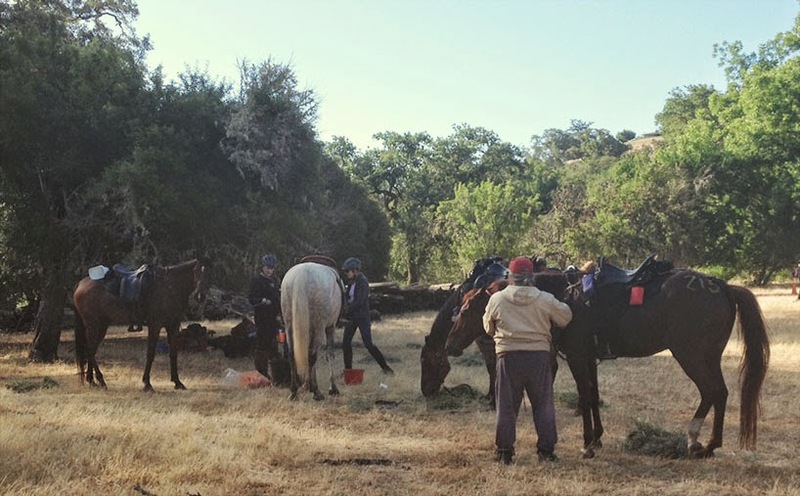 So as I, "the runner," ran cards over to P&R, the riders immediately took horses over to water buckets and sponged down (careful to avoid muscles and cramping), and often untacked. Once they left P&R they went on to the vet check which looked at a whole litany of things including gut sounds and soundness at a jog. Once the horse was cleared they had an hour for some R&R- in addition to hay many riders would make watery mashes to encourage hydration. There is a final vet at the end of the ride and out of the top 10 riders the winner is determined by the "best conditioned" horse. Two horses were pulled from the race and taken back to camp (lameness and pulse) but outside of that there were no health issues! I thought both the riders apparel and horses tack were super interesting. 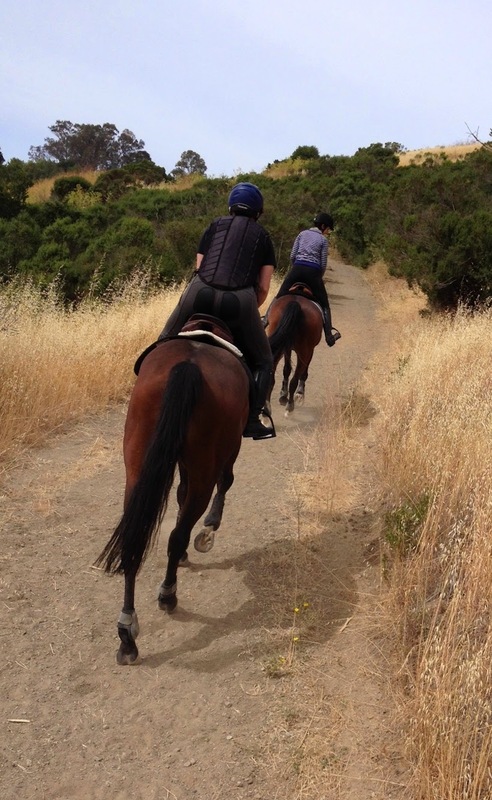 In many cases the riders wore sneakers as the hills can be so steep they are dismounting and running alongside the horse. 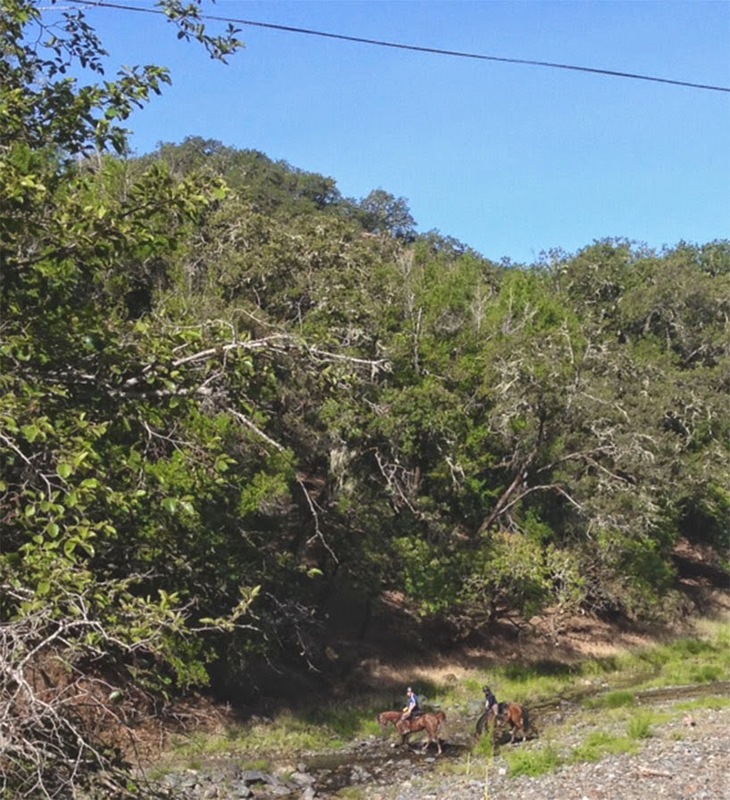 Little J was telling me on the way home that there's a hill in Tevis that's so steep that riders will "tail-" meaning the horse walks in front and the rider walks behind holding their tail to stay upright. Some great matching outfits! Brightly colored bridles! Horse "Sneakers" instead of steel shoes! Mighty comfy looking saddles (might give the CWD a run for its money)! The vast majority of horses present were Arabians but there was one Morgan, a few Mustangs (the horse that won the 50 was a Mustang), and one lone Warmblood. Some of the riders traveled in packs of two or three- but plenty tackled the trail alone! Everyone gathers at the end of the day for awards and a giant dinner (we had fried chicken) before retiring back to their campsites, perhaps resting for another race the next day! The most adorable roached mane! This poor gal missed a turn in her 25 mile ride and ended back up at the vet check! 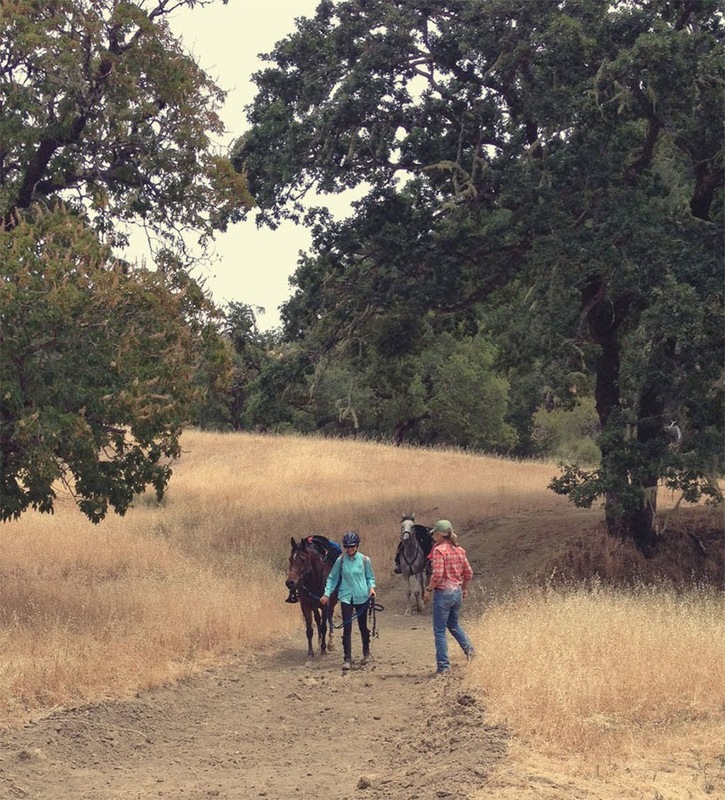 Heading back out on the trail! Everything must match! I love this discipline already! The winner of the 50 mile race and his mustang! Love! 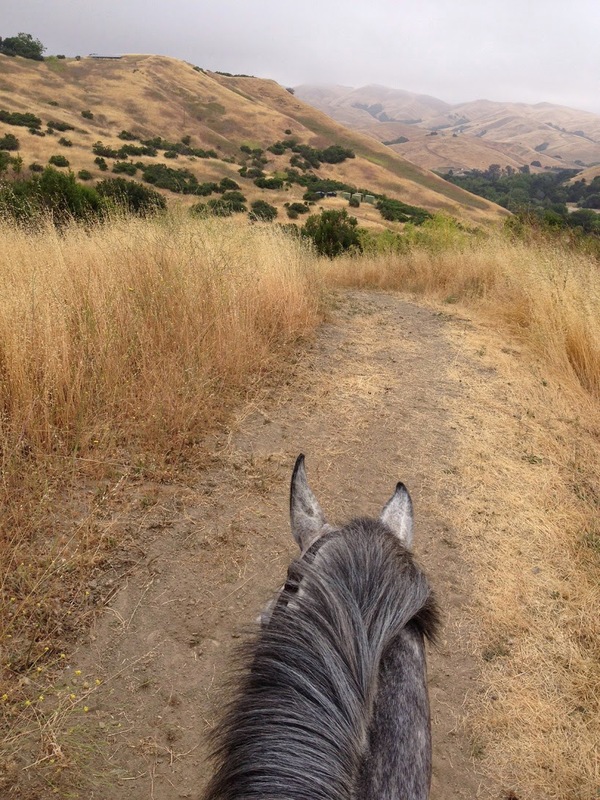 Ellie and I went on a solo trail ride on Sunday when there was still a little fog lingering over the hills. So peaceful with a few deer & turkey sightings. Big shout out to two Dads on Father's Day! We had a blast with my Dad last weekend and today Paul not only celebrated Father's Day (Cat & Horse Dad) but we also celebrated 9 years together! 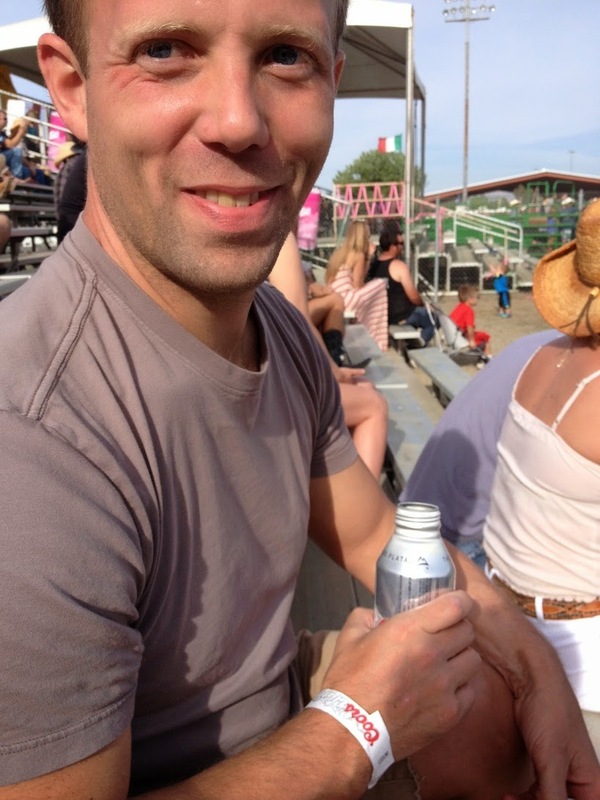 Naturally he was tasked with planning the entire day so we spent the afternoon at Del Valle Lake sunning and then ended the day with the Livermore Rodeo and burgers on the grill! 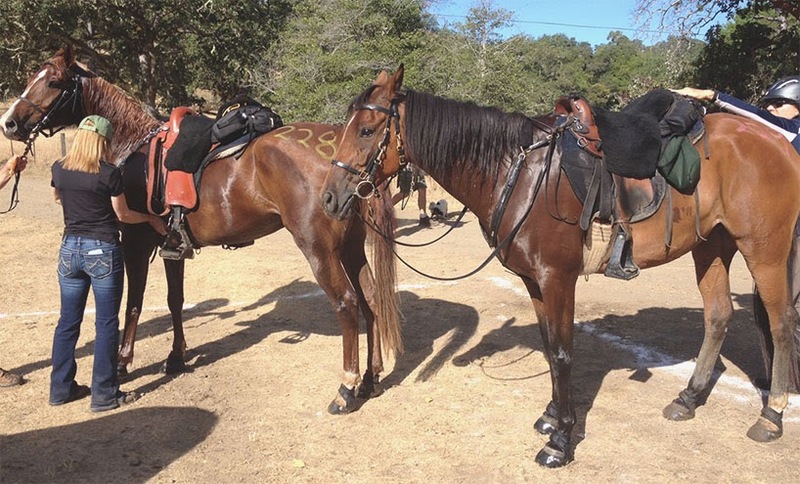 Since this is a horse blog, I do have to call out how supportive both these guys are of the riding. Dad has a boat- so he totally "gets it." Paul may not fully understand the compulsion yet but certainly doesn't seem to mind all the hours spent at the barn and lets me borrow $20 bucks here and there since I'm "horse" poor all the time. Personally Preppy is a fabulous company, owned by two sisters, that is taking the monogram world by storm! 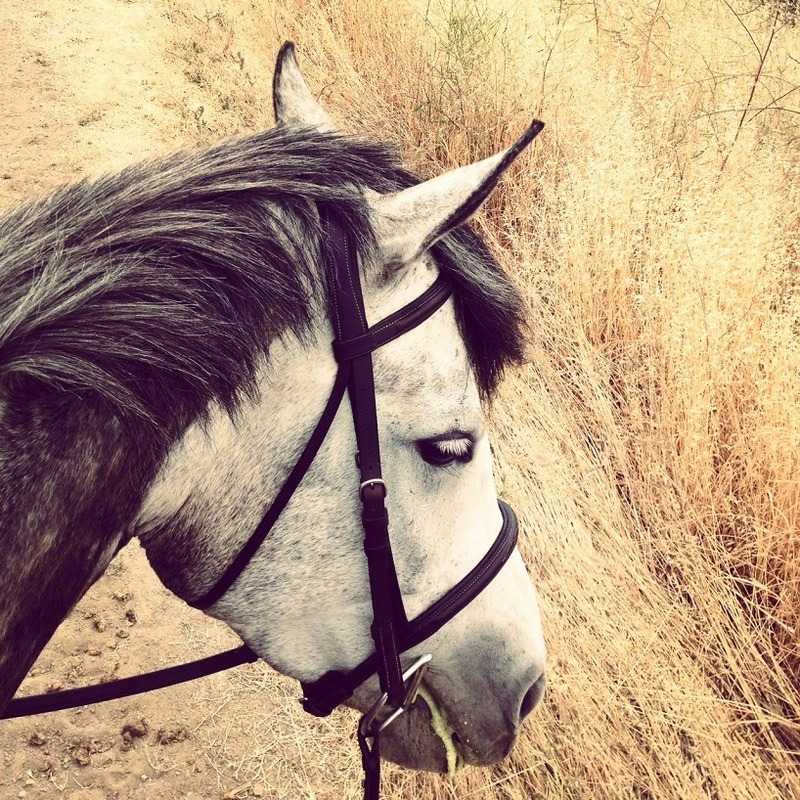 She Moved to Texas posted an awesome helmet mono on her Instagram and the the $900 facebook pony just wrote an excellent business spotlight on her blog. 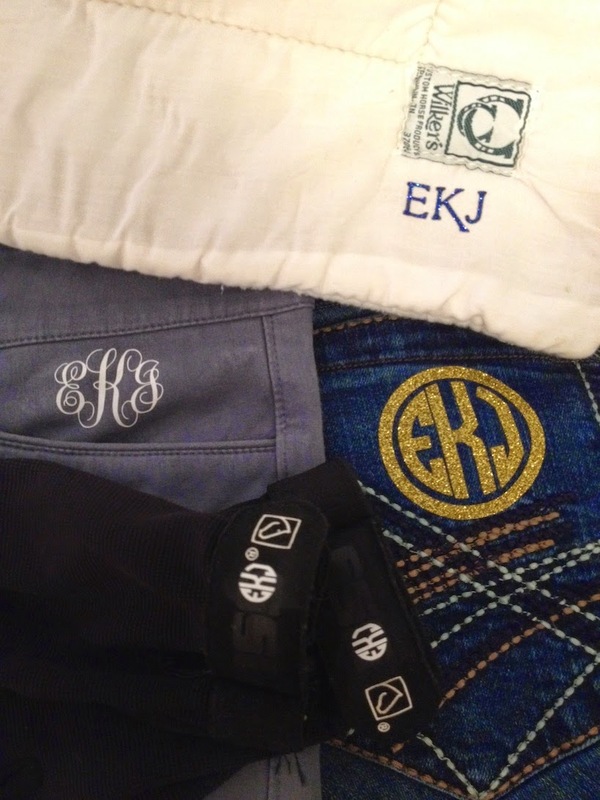 I knew I had to jump on the monogram bandwagon but I did have one hold up. I'm not crafty and don't have "the eye" so when confronted with ALL of the awesome options on the PP Etsy page I just couldn't decide what I wanted. So I said, "Tate, Kir- make me a goody bag of all the fun things." And by God they did. 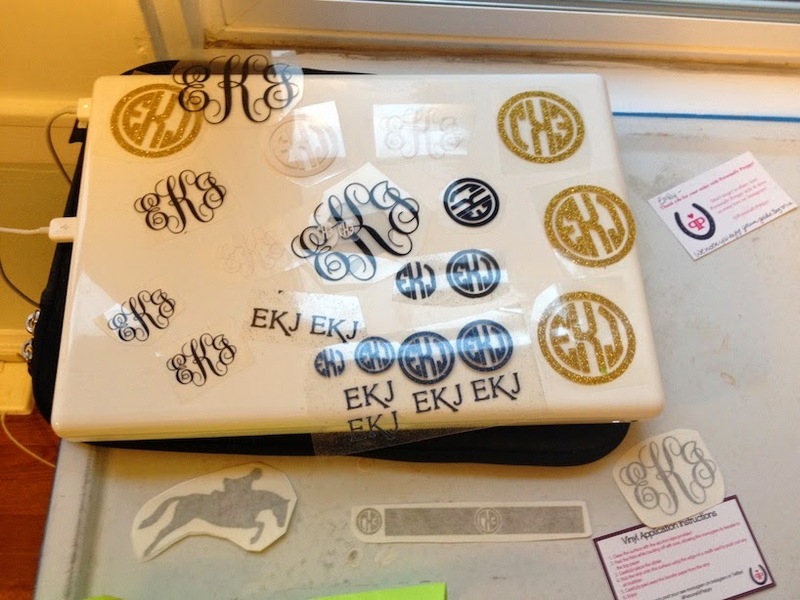 Monogram Madness is what I call it. I've been locked in my office for the past few evenings carefully ironing my initials onto every stitch of clothing I own (and pillow wraps- I will never lose those things again). I am, however, careful to stop after I've had two glasses of wine. My coordination skillz tend to falter at that point. And I did have some learnings. All those great vinyl stick on monograms that everyone is adorning their Samshields with? No matter how hard I rubbed with a credit card it just would not adhere to the furriness of my Charles Owen. Lightbulb moment- can I heat press one of the monograms on? I had to shelve that experiment until this evening. I had reached my self imposed wine limit on Tuesday and was slightly wary of testing my theory on my year old Ayr8. Also, after reading through the $900 facebook pony DIY helmet project I was reminded that I had an old CO that had seen one too many falls in the trunk of my car. Bring it on hot iron and velvet- let's see what happens! And.....it actually worked. Really quite well actually! 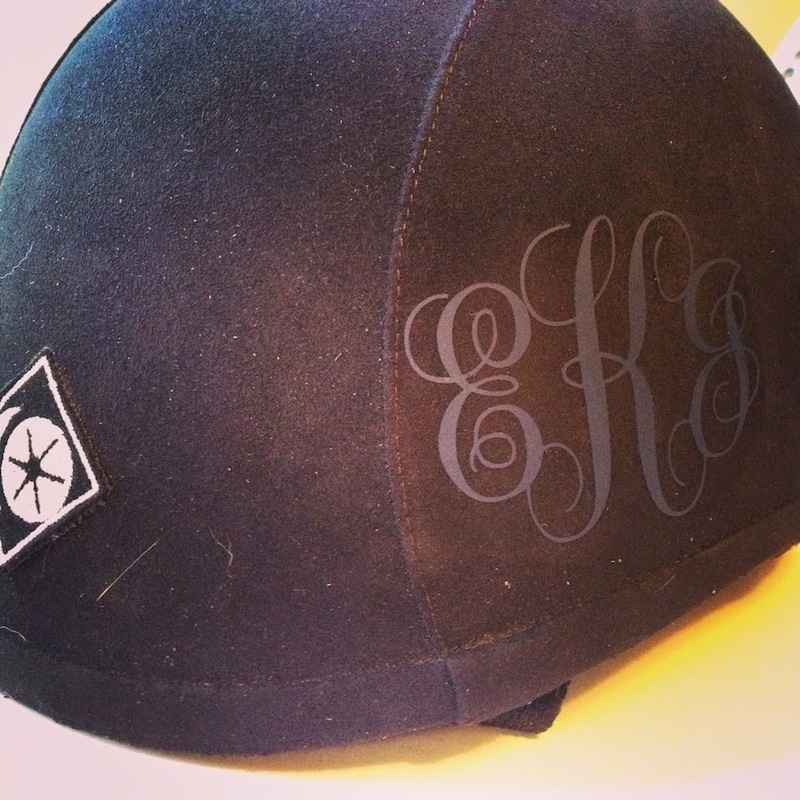 I'm going to be ordering a slightly smaller black version (my script monograms are navy) ASAP! A random aside: Miss "Clairified" stopped by my desk with the new Higher Standards Viva Carlos Saddle Soap in Sweet Lemon. It smells amazing!